IncluSMe (Intercultural learning in mathematics and science initial teacher education) focuses on increasing the quality of the initial teacher education (ITE) of prospective mathematics and science teachers by including intercultural learning into their curricula: Prospective mathematics and science teachers need to learn how to cope with language barriers, culturally different pre-concepts about science and highly varying proficiencies of (immigrant) students to be prepared to tackle the challenges of their future profession. In turn, maths and science competences are crucial for civic participation, academic and professional success, not only for students with diverse backgrounds but for all. But if comprehension and communication problems due to language barriers or cultural differences are not addressed, students with immigrant background may perform poorly in maths and science. In order to secure educational opportunities for immigrant and refugee youth, it is essential to include intercultural aspects into the initial education of maths and science teachers. Thus, our project, aims to improve the relevance of higher education curricula for prospective maths and science teachers by linking maths and science education with intercultural learning – and thereby strengthening students’ social, civic and intercultural competences. Core to the project is the design and implementation of related open access teaching modules, to facilitate intercultural learning for prospective maths and science teachers. These modules will be purposefully designed (flexible structure, modular, user guidance) so that they can be easily used in existing university courses and curricula. Thus, the connectivity of the developed materials is ensured and will pave the way for updated curricula in maths and science ITE. By offering international summer schools and multiplier events, IncluSMe will strengthen transnational cooperation between universities in establishing mobility programmes for maths and science students in initial teacher education. Main target group of the project are university teachers in maths and science ITE, in particular those concerned with HE curriculum development and/or student mobility. They will integrate the HE modules created within the project into their regular university courses. Other target groups are enablers of student mobility and policy makers. 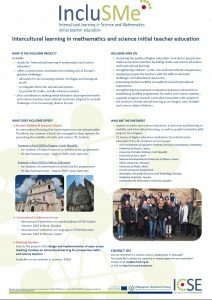 The project brings together 11 teams of higher education institutions for initial teacher education from across Europe comprising experts in maths and science education, in inclusion and diversity, in mobility and intercultural learning, as well as people involved in pilot projects for refugees. The IncluSMe project has received funding from Erasmus+ KA2 (Key action for ‘Cooperation for Innovation and the Exchange of Good Practices’) and is coordinated at the International Centre for STEM Education (ICSE) of the University of Education Freiburg, Germany.